11 Things every Tax Payer should be Careful About! Why you should NOT report wrong exemptions or under-state income? The first reason you should NOT report wrong exemptions or under-state income is its legally wrong and when caught you would have to do a lot of run around and in some cases may even lead to heavy fine and jail. With advent of technology and more and more linkage through PAN and Aadhaar number, it has become easier and efficient for income tax department to capture information about your income, expenses and donations. For people paying taxes for long time, they can feel the changes that have happened in last few years and its getting tougher for people to escape taxes especially if you are salaried as all your income is accounted for! Keeping the above in mind, here are 11 things which tax payers should not do (knowingly or otherwise) while reporting their income in income tax returns. This is probably most abused income tax exemption by salaried tax payers. In the last few years income tax department has tightened this exemption. It started with asking for PAN number of landlord if the annual rent payable was more than Rs 2 lakhs, which was later reduced to Rs 1 lakh. The new ITR Forms now also ask for tenant PAN number which would further help to link both the transactions. My advice, if you do claim HRA by paying rent to your parents/relatives, do have that transaction through your bank account and get a lease agreement done. This would help you in case of any further questions by IT Department in future. We have always stated to check your Form 26AS while filling your Tax returns. This is essential as Form 26AS records of most of your fixed/recurring deposits and TDS deducted. This also has records of FD/RD where you have submitted Form 15G/15H. One thing to note is TDS is not the final tax, you need to calculate your taxes on FD/RD/Saving Account and pay taxes as required. Remember saving account details are still not on Form 26AS but you need to give details of all your accounts in ITR Forms. In fact last assessment year 2017-18 a lot of tax payers received notice as they had not included their interest income on fixed deposit, recurring deposit and savings account correctly. 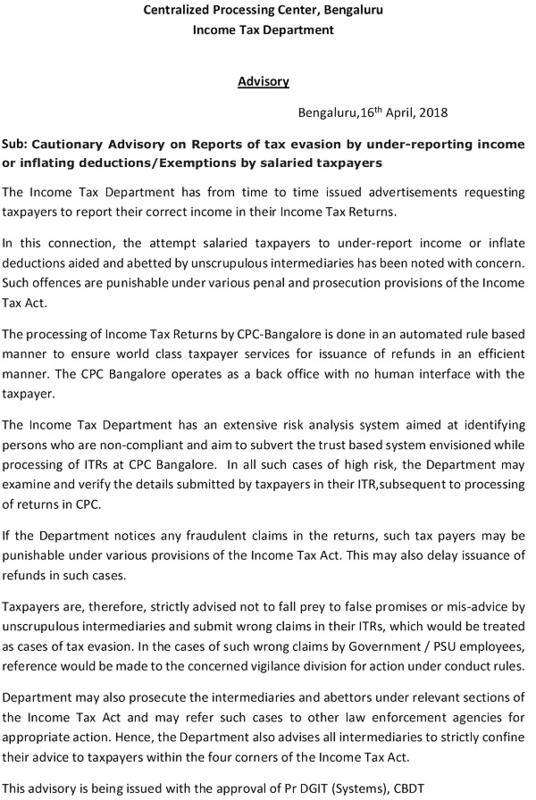 Income tax department allows salaried tax payers to claim tax exemption u/s 80C while filing income tax returns even if they had not submitted the proof for the same to their employer. Unfortunately, this has been misused by people as while filing ITR NO proof is required. But again, last year a lot of salaried received income tax notices as their Form 16 details from employer did not match with ITR. In reply to these notices people had to attach the relevant proof of 80C exemptions. Also Read:15 Investments to Save Tax u/s 80C – Which is the Best? Sections 80G, 80GGA, 80GGC related to donation to listed institutions, NGOs, political parties have been used by some tax professionals to lure unsuspecting tax payers to lower the tax outgo or claim tax refunds. Do not fall for such schemes as in case caught not only the professional but even the tax payer would have to face legal action. If you have invested in the name of your spouse or children, the income generated has to be clubbed to your income (exception available in certain conditions). Make sure to declare this income and pay taxes accordingly. Also Read: How your wife can help you save taxes? There are many landlords who take rent but do not declare it as income. This may come to haunt them back. Income tax department knows of this leakage and is tightening the rental income by asking for PAN number of landlords. Also, many times due to ignorance, people with more than one house DO not show deemed rental if the other house is vacant. As per income tax rules, in case of more than one house, you can have one house as self-occupied while for all other houses you need to have deemed rental income even if those are not on rent. It may have been possible that you had changed your job. While filing your income tax return you must put details of both the employers and respective income. This is important as income tax department anyway has this information and you can also check the same in Form 26AS. Some people other than just salary income also work as freelancer or work part-time and earn money. For example, you might be giving tuitions, work on technical aspects as freelancer or run a website. All this gives money which may be small as compared to your salary. But you must show these income in the appropriate sections and pay tax accordingly. There are cases where some tax payers intentionally or otherwise claim interest exemption for home loan which may not be valid. For e.g. interest paid on loan for plot or for under-construction house is not exempted as per income tax rules. Also, there have been cases of claiming higher amount then actually paid. To match the numbers, IT department has started asking for PAN number of lenders from last few years. In case you do not want TDS to be deducted from your interest income, you can fill Form 15G/15H. however the eligibility to fill the same is based on your annual income. So, you must check your eligibility before filling Form 15G/15H as wrong submission may lead to fine from IT department. Also Read: Check eligibility & How to Fill Form 15G/15H Online? In the past a few taxpayers in a bid to save tax on their capital gains made false claims u/s 54, 54F, 54EC, etc. New ITR Forms require to submit the details of the investment made under these sections and also the details of capital gain account in case you have deposited the same in bank. As you can see with new technology, income tax department is able to track the income and expenses for most especially salaried as the income always passes through banking channels. However, the department is lagging behind in tracking people income from unorganized business, rent etc. This has created a feeling among salaried about the department going after the more honest salaried tax payers rather than the BIG fish! I too echo this sentiment but then this does not justify under-reporting of income or claiming wrong deductions for salaried. My recommendation pay your taxes honestly and live a worry free life! And if you want to learn more about all the tax exemptions and benefits available to salaried, professionals, senior citizens – Do download a short presentation here. This will help you plan and save taxes the RIGHT way! Can you tell how cashback and rewards points earned on credit card be treated while filing tax returns. I think recent warning from IT department for Salaried individuals cautioning about fake bills or incorrect deduction is having some impact.